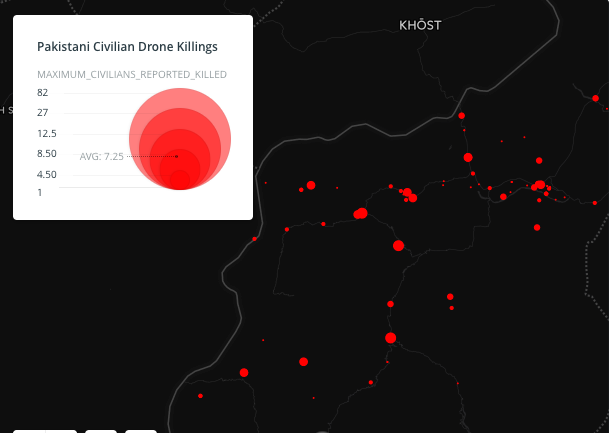 In my analysis of CIA-directed drone strikes in Pakistan’s Federally Administered Tribal Areas (see ‘Dirty Dancing’: DOWNLOADS tab) I drew upon the tabulations provided by the Bureau of Investigative Journalism and Chris Herwig‘s cartographic animation of casualties between 2004 and 2013: see my discussion here and the maps here. There’s not much geographical analysis – apart from noting the focus on North and South Waziristan – and, as I argued before, I think it a mistake to isolate drone strikes from the wider matrix of military and paramilitary violence in the borderlands (including air strikes by the Pakistan Air Force). 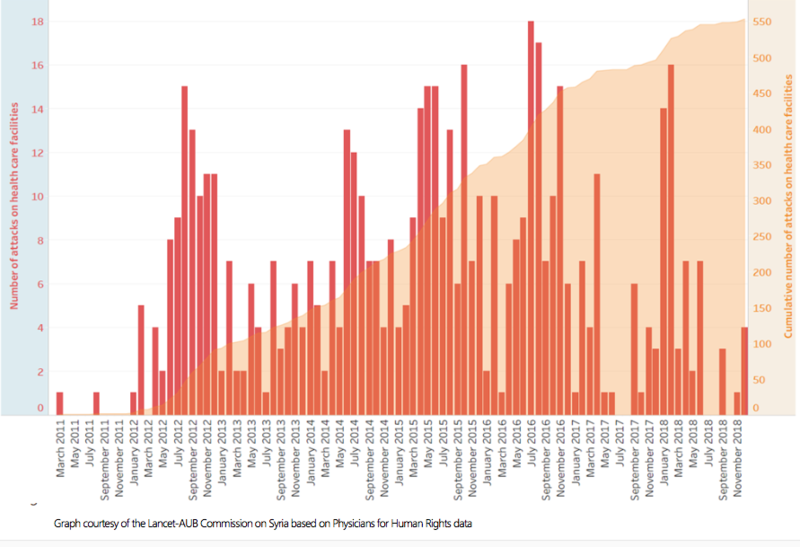 And there are obvious problems in disentangling civilian casualties – the US Air Force has the greatest difficulty in identifying civilians in the first place. The story Mir Azad came to tell is this [and, as Madiha shows, he had travelled 500 difficult miles across South and North Waziristan to tell it]. 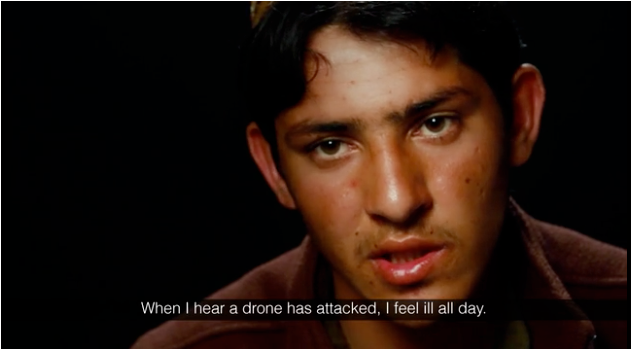 In July 2015, American drones bombed and killed two of his cousins, Gul Rehman Khan and Mohammad Khandan. After Zarb-e-Azb began in June 2014, thousands of Waziris fled in all directions, businesspeople, farmers, militants, and students, including to the Pakistani villages in Barmal, and there the drones followed. The military operation and the “surgical” operation, carpet bombing and “precision strikes,” coordinated maybe, intentionally or not, they worked together to redraw the lines of movement, new containment zones, a shockwave that could start with ground troops in North Waziristan and end with a drone bombing a car in Barmal [in Paktika province, on the border with North Waziristan]. My extract can’t do justice to the essay: do read it if you can. 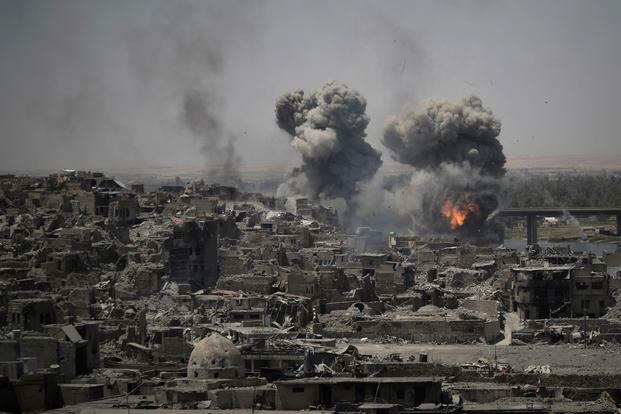 “(The) military has removed the roofs of the houses to have a better aerial view and stop militants taking refuge in these abundant, fort-like mud houses,” the official told reporters. From the helicopter journalists could see scores of homes with no roofs but appearing otherwise intact, their interiors exposed to the elements. 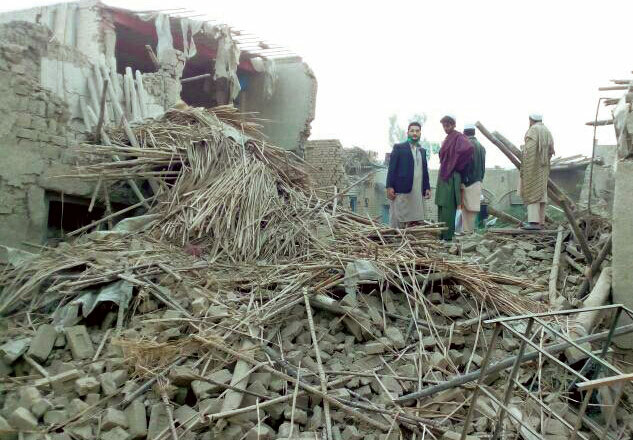 But in many cases – especially in North Waziristan – those ordered by the military to leave their homes have returned to find them reduced to rubble. 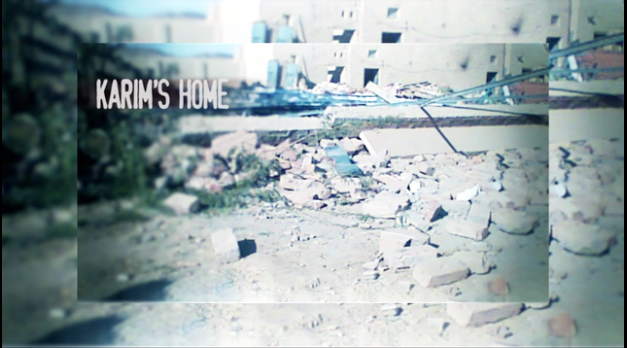 Murtaza Dawar sat with his children and cousins on the debris of his house. Behind him the setting sun was a ball of fire in the sky, reducing him and his family to silhouettes, the shards of glass in the wreck of his house catching the light and winking in the gathering dark of an early evening. Coming back home to Mirali in North Waziristan has been a bittersweet experience for Dawar, 48. Sweet because he and his family has returned home after more than two years of displacement. Bitter, because they have come back to wreckage where their home was. 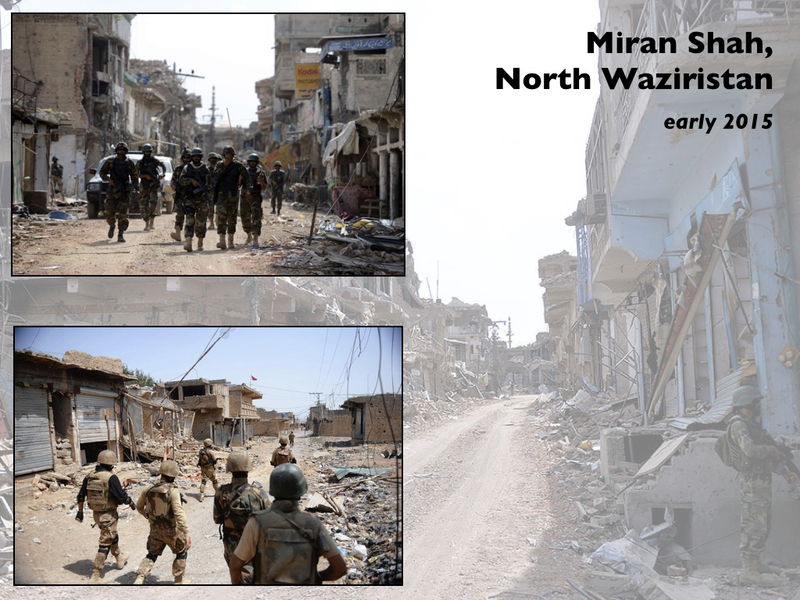 Dawar’s is not the only house that was razed during the military operation Zarb-e-Azb, launched in June 2014 to clear North Wazristan of militants. Of the nearly million tribesmen displaced by the operation, many have lost not only their belongings and assets they left behind in the tribal district and their houses have been demolished for no reason. The government has not issued any clear data on the number of houses demolished in North Waziristan. In May 2016, a property damage survey conducted by the Fata Disaster Management Authority (FDMA) revealed that 11,663 houses were fully and partially damaged during operations against militants in South Waziristan, North Waziristan and the Khyber Agency. 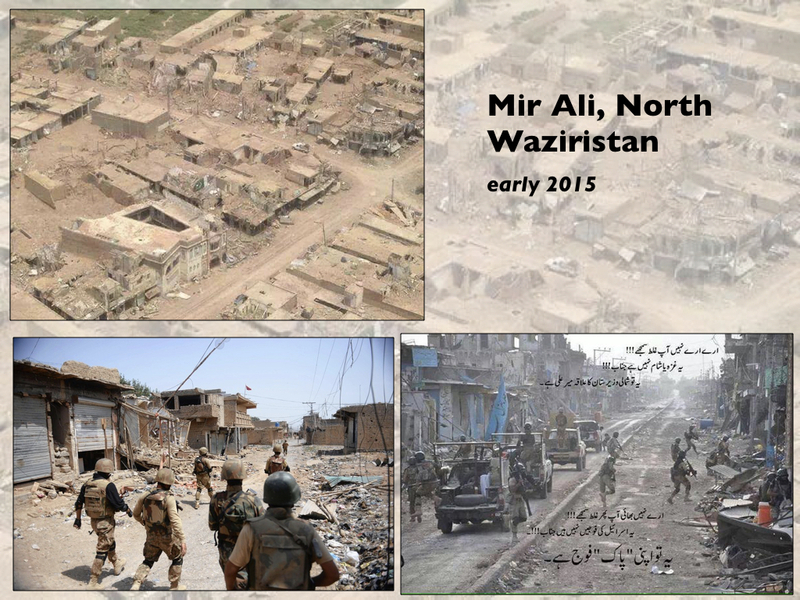 Local tribesmen working in the political administration’s office in North Waziristan told Truth tracker on condition of anonymity – because of the sensitivity of information – that about 1500 houses were completely destroyed in the Mirali subdivision alone. Cartographic animations can’t capture these in-animations, but we must surely do our best to attend to them. That’s as good a summary of the project as you’ll find, but en route you also understand the ‘situatedness’ of the project – that’s an inadequate formulation, I increasingly think, since it’s also about extending deep into what, for want of a batter word, we might call the field: it’s about the rootedness of Forensic Architecture in the lives of the uprooted. And as you follow Eyal through occupied Palestine, you also realise that there is something vitally defiant in so thoroughly challenging Israel’s rhetorical claim to the ‘facts on the ground’. Better late than never… I talked about Robert Greenwald‘s Unmanned before – the video documentary he produced to accompany the Stanford/NYU report Living under Drones – and I’ve now discovered you can still watch all 61 minutes here. 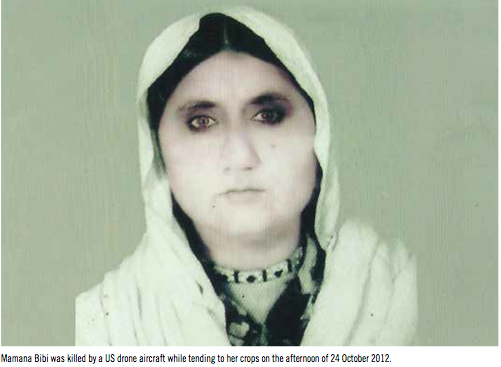 Beginning at 39:08 there is a harrowing account of the murder of Mamana Bibi in Waziristan on 24 October 2012. There is a detailed investigation in Amnesty’s Will I be next? and its forensic detail is compelling, but watching and listening to the surviving members of her family adds a new dimension to the horror. Qadri reached out to trusted sources in North Waziristan. The family members and their neighbors were interviewed independently on multiple occasions, unaware that a human-rights group was behind the questions they were asked. Over the course of many weeks, Qadri found the family’s account to be consistent. He determined it was highly unlikely that any militants were present at the time of the strike and that the missiles were likely fired by a US drone. I doubt that he needs any lessons on ethics or methodology. 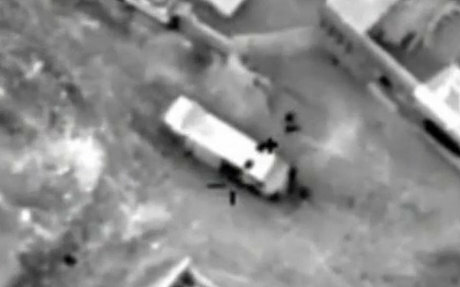 Several recent contributions on military drones – what Forensic Architecture calls Unmanned Aerial Violence – you might be interested in. Pakistan’s generals and politicians, who come mainly from the country’s dominant, more developed province of Punjab, treated Waziristan’s residents “as if they were tribes that were living in the Amazon,” the journalist Abubakar Siddique, who grew up in the region and is the author of “The Pashtun Question,” told me. 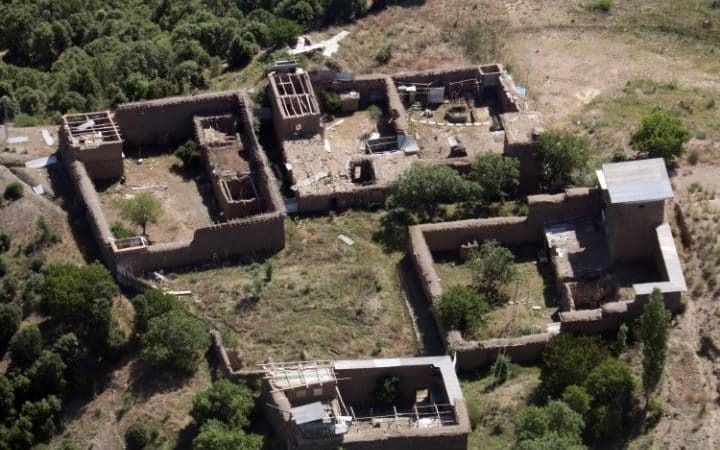 Families in North Waziristan typically live within large walled compounds. Several brothers, their parents, and their extended families might share a single complex. Each compound may contain a hujra, or guesthouse, which usually stands just outside the main wall. In the evening, men gather there to eat dinner and talk war and politics. A rich man signals his status by building a large hujra with comfortable guest rooms for overnight visitors. The less well-heeled might have a hujra with just two rooms, carpets, rope cots, and cushions. Taliban and Al Qaeda commanders moved from hujra to hujra to avoid detection. The available records of drone strikes make clear that the operators would regularly pick up commanders’ movements, follow them to a hujra attached to a private home, watch for hours—or days—and then fire. 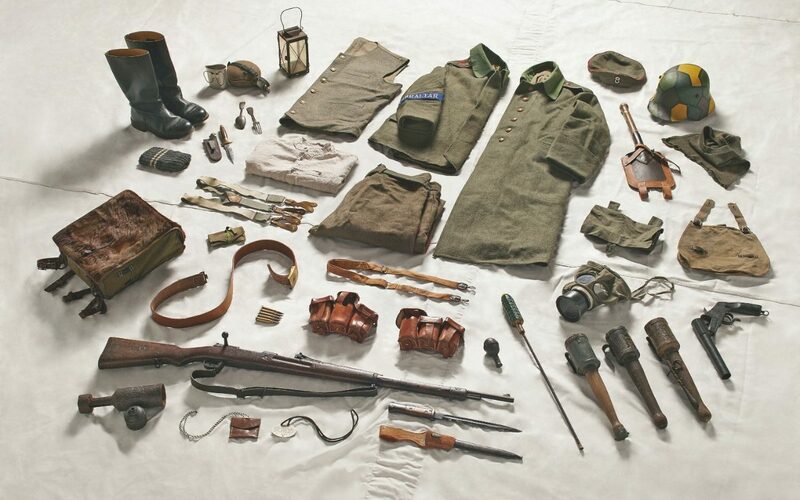 Many documented strikes took place after midnight, when the target was presumably not moving, children were asleep, and visitors would have returned home. “You can’t protect your family from a strike on a hujra,” another resident of North Waziristan said. “Your children will play nearby. They will even go inside to play.” The researcher in Islamabad said, “There is always peer pressure, tribal pressure, to be hospitable.” He went on, “If you say no, you look like a coward and you lose face. Anyway, you can’t say no to them. If a drone strike does take place, you are a criminal in the courts of the Taliban,” because you are suspected of espionage and betrayal. “You are also a criminal to the government, because you let the commander sleep in your hujra.” In such a landscape, the binary categories recognized by international law—combatant or noncombatant—can seem inadequate to describe the culpability of those who died. Women, children, and the elderly feel pressure from all sides. A young man of military age holding a gun outside a hujra might be a motivated Taliban volunteer, a reluctant conscript, or a victim of violent coercion. 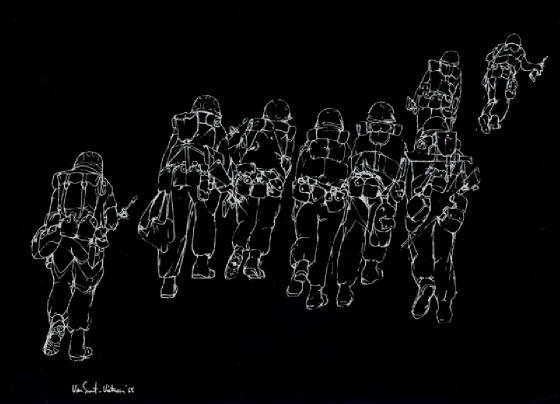 This speaks directly to a general point made by Christiane Wilke: in today’s wars the requirement that combatants identify themselves as combatants (a standard obligation of international humanitarian law) has effectively been transferred to civilians, so that it becomes their responsibility to make themselves known as non-combatants. Even to an unblinking eye at 20,000 feet. And so, as so often happens in the United States (and elsewhere) too, our gaze is directed away from the victims and towards the torment suffered by those who inflict military violence from the air. 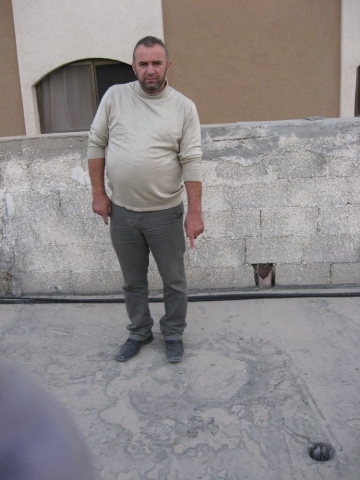 Some drone-fired missiles can drill a hole through the roof before burrowing their way deep into buildings, where their warheads explode. The size of the hole the missile leaves is smaller than the size of a single pixel in the highest resolution to which publicly-available satellite images are degraded [a square that translate sin to 50 cm by 50 cm of terrain]. The hole is thus at the “threshold of visibility” and might appear as nothing more than a slight color variation, a single darker pixel perhaps. 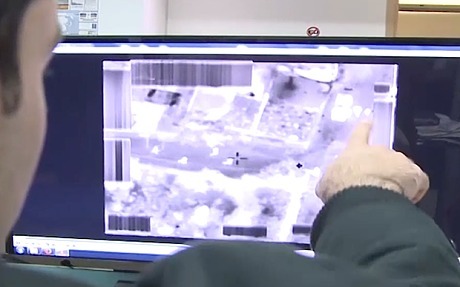 This has direct implications for the documentation of drone strikes in satellite imagery, which is often as close to the scene as most investigators can get. When the figure dissolves into the ground of the image, it is the conditions—legal, political, technical—that degrade the image, or that keep it at a lower resolution that become the relevant material for forensic investigations. 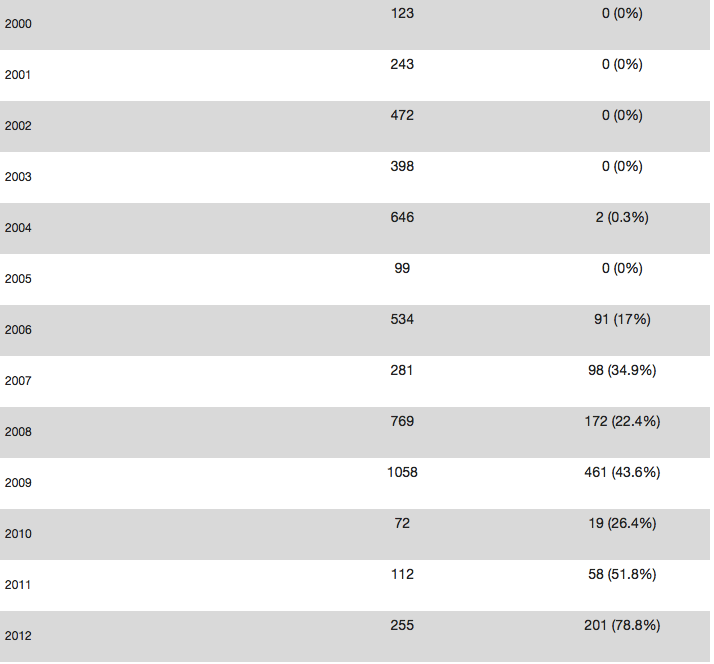 I’m not sure what the sources for these tabulations might be: as Craig Jones has emphasised in a vitally important post, it’s exceptionally difficult to parse Israel’s targeted killings in occupied Palestine, and while these tabulations clearly include many other situations I have no idea how you begin to separate different killing machines in what is, after all, a networked mode of military violence in which drones are likely to perform vital surveillance operations for strikes carried out from other platforms. But the increased reliance on drones chimes with the report from David Blair. 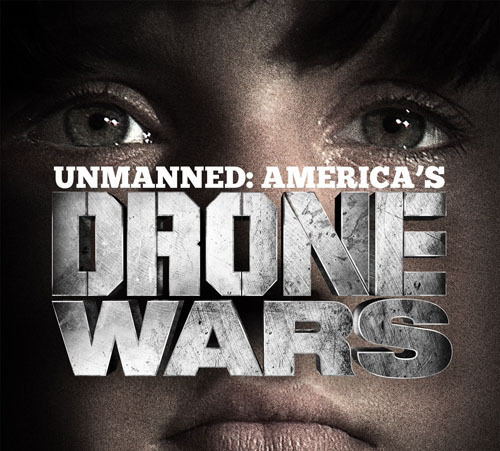 Robert Greenwald‘s feature-length documentary film Unmanned: America’s drone wars is being released on 30 October: it will be streaming online for a limited time, but if you sign up here you will be able to watch it thanks to Brave New Foundation free of charge (and no, this isn’t piracy). Thanks to Jorge Amigo and Sara Koopman for the heads-up. 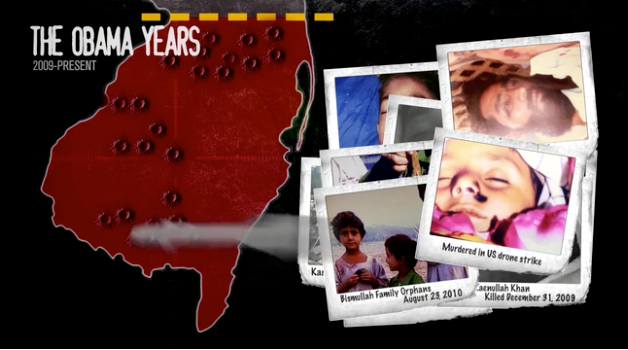 For more details on the project to bring them to the United States and the horrors that they witnessed, see Ryan Devereux‘s chilling report here about the murder of Mamana Bibi. ‘Zubair, now 13, said the sky was clear the day his grandmother died. He had just returned home from school. Everyone had been in high spirits for the holiday, Zubair said, though above their heads aircraft were circling. Not airplanes or helicopters, Zubair said. “I know the difference,” Zubair said, explaining the different features and sounds the vehicles make. “I am certain that it was a drone.” Zubair recalled a pair of “fireballs” tearing through the clear blue sky, after he stepped outside. After the explosion there was darkness, he said, and a mix of smoke and debris. “When it first hit, it was like everyone was just going crazy. They didn’t know what to make of it,” Zubair said. “There was madness.” A piece of shrapnel ripped into the boy’s left leg, just above his kneecap. A scar approximately four inches in length remains. “I felt like I was on fire,” he said. The injury would ultimately require a series of costly operations. Nabeela, the little girl, was collecting okra when the missiles struck. “My grandma was teaching me how you can tell if the okra is ready to be picked,” she said. “All of the sudden there was a big noise. Like a fire had happened. This is exactly that I meant when I said that all these targeted killings – and this was one which surely went hideously wrong (though I’m not sure what going right would look like) – have effects that reach far beyond the individual victim. The ‘individuation of warfare‘ is never confined to an individual; and in this case, like so many others, it’s not warfare either. UPDATE: The Independent carries an early report of the testimony of Mamana Bibi’s son here and the Guardian here (‘Bibi’ simply means ‘grandmother’ and is an honorific – the family name is Rehman). 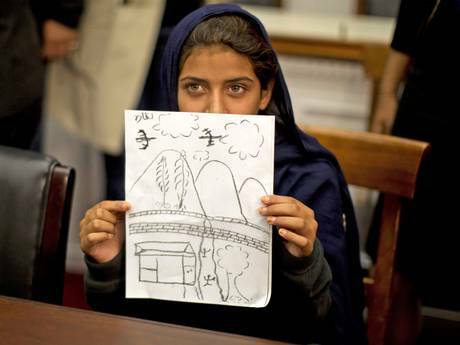 In the image below, her grand-daughter is holding her drawing of the attack. Read this alongside Kenneth Anderson and Benjamin Wittes here – with their double-act doublespeak of Amnesty International’s ‘coyness’ and its ‘blithe claims’ (do they know what these words mean??) – and retch. 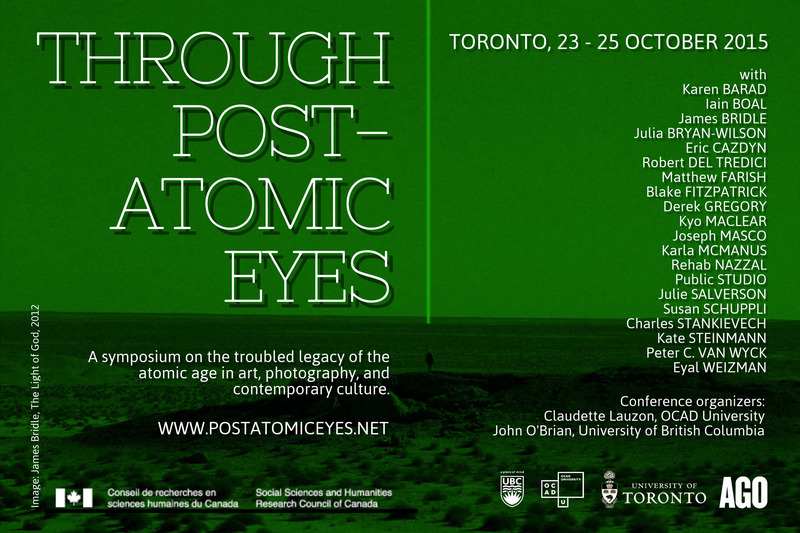 Just back from a wonderful trip to Toronto and York, where (among other things) I gave a new presentation on “Drones and the everywhere war“. 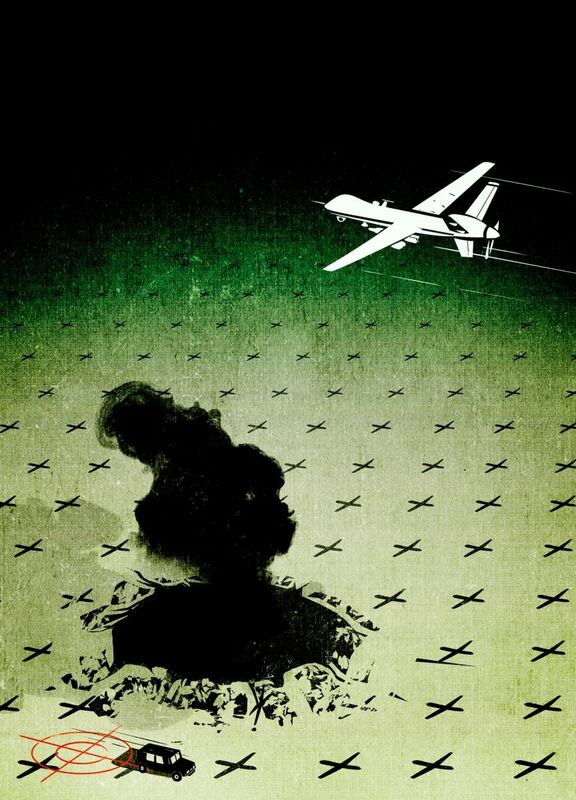 It turned out to have been timely: there’s been a flurry of revelations and reports about the US campaign of targeted killing in Pakistan and Yemen, and I managed to incorporate some of them into the argument. I’ll be posting about all this shortly, but in the meantime – and directly related – news from Madiha Tahir that Wounds of Waziristan premieres on VICE Motherboard on line for a limited period today. It’s smart and stunning, and addresses a swath of vital issues about the drone strikes in just 25 minutes: from their colonial antecedents in ‘air policing’ and the special laws imposed on the Federally Administered Tribal Areas by the British state through extraordinary testimony from survivors to the collusion between the US and Pakistan in exposing the population of FATA to military violence. Reading and thinking about these testimonies has helped convince me that the root problem with drones is not that they enable killing from a distance: as I’ve said before, if you object to killing someone 7,500 miles away, over what distance do you think it is acceptable? In fact, although Predators and Reapers are controlled from the continental United States they have to be deployed close to their targets: these are not weapons of global reach. One of the most fundamental issues is that they can only be used in uncontested air space, so that they are limited to haunting the skies over some of the most vulnerable and marginal populations on earth, whose own governments care little about them and where the distinction between a combatant and a civilian is made to count for precious little. One of my next tasks is to revise “Moving targets and violent geographies” (DOWNLOADS tab) to incorporate these reports and to emphasise this conclusion.